Here we offer heavy duty, reusable security bag holdalls, featuring carry handles and an internal clear address label pocket. Suitable for the secure distribution of bulk documents, mail, medical records, equipment etc. 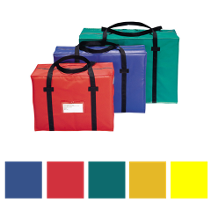 Combining a tamper evident zip lock, with either plain, colour coded or sequentially numbered security seals, they are available in three sizes with a choice of colours from stock as below. Item # H1=405mm x 305mm x 203mm £18.00 ea excl VAT and carriage. Item # H2= 508mm x 356mm x 152mm £19.50 ea excl VAT and carriage. Item # H3= 584mm x 406mm x 254mm £21.00 ea excl VAT and carriage.